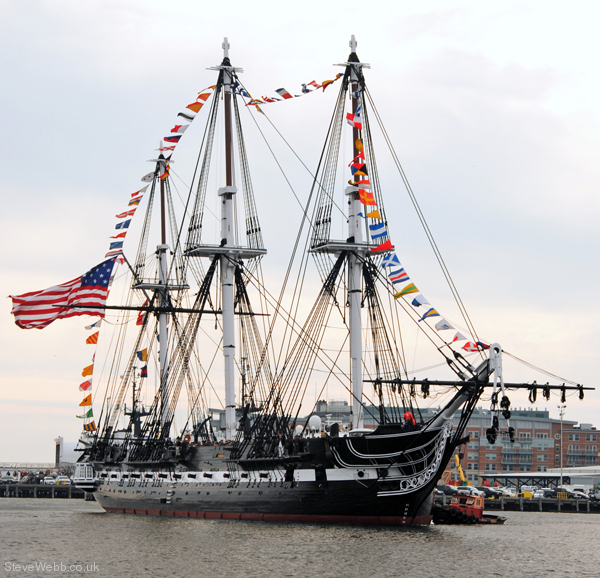 USS Constitution is a wooden-hulled, three-masted heavy frigate of the United States Navy. Named by President George Washington after the Constitution of the United States of America, she is the world’s oldest floating commissioned naval vessel. [Note 1] Launched in 1797, Constitution was one of six original frigates authorized for construction by the Naval Act of 1794. Joshua Humphreys designed the frigates to be the young Navy’s capital ships, and so Constitution and her sisters were larger and more heavily armed and built than standard frigates of the period. 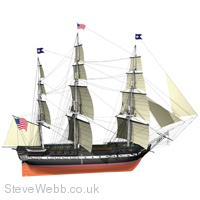 Built in Boston, Massachusetts at Edmund Hartt’s shipyard, her first duties with the newly formed United States Navy were to provide protection for American merchant shipping during the Quasi-War with France and to defeat the Barbary pirates in the First Barbary War. Constitution is most famous for her actions during the War of 1812 against Great Britain, when she captured numerous merchant ships and defeated five British warships: HMS Guerriere, Java, Pictou, Cyane and Levant. The battle with Guerriere earned her the nickname of "Old Ironsides" and public adoration that has repeatedly saved her from scrapping. She continued to actively serve the nation as flagship in the Mediterranean and African squadrons, and circled the world in the 1840s. During the American Civil War she served as a training ship for the United States Naval Academy and carried artwork and industrial displays to the Paris Exposition of 1878. Retired from active service in 1881, she served as a receiving ship until designated a museum ship in 1907. In 1931 she started a three-year 90-port tour of the nation, and in 1997 she finally sailed again under her own power for her 200th birthday. Constitution's mission today is to promote understanding of the Navy’s role in war and peace through educational outreach, historic demonstration, and active participation in public events. As a fully commissioned US Navy ship, her crew of 60 officers and sailors participate in ceremonies, educational programs and special events while keeping the ship open to visitors year-round and providing free tours. The officers and crew are all active-duty US Navy personnel and the assignment is considered special duty in the Navy. Traditionally, command of the vessel is assigned to a Navy Commander. She is berthed at Pier 1 of the former Charlestown Navy Yard, at one end of Boston's Freedom Trail.